Should We Avoid Investing With Banks? In the past decade, the banking system has faced near collapse from the fall-out of the 2008 financial crisis, it has been forced to pay millions of pounds in PPI compensation, and it has endured considerable cutbacks to their workforce. But in recent years, improved financial stability has helped banks to stabilise and strategise additional revenue opportunities. As a result, banks have begun to increase their investment services as they try to generate more fee revenue by selling their own range of pension and investment funds. As banks begin to regain the trust of savers they have ramped up their marketing and brand awareness strategies, which has also helped to increase investor confidence in their investment products. But, how have the funds offered by banks performed? And do they provide competitive investment opportunities? For this report, we analysed the funds provided by some of the UK's largest banks, and we discover that a significant proportion have continually underperformed. Earlier this year Lloyds Banking Group announced it would plough £3 billion into a development strategy in which growth of their financial planning and retirement propositions will be key priorities. Lloyds already have sizeable client assets from their existing range of life funds, offshore funds and pension funds, with £109 billion of mainly pensions money from their Scottish Widows funds currently contracted out to be managed by Aberdeen Asset Management. Our analysis of the 37 life, pension and offshore funds currently offered by Lloyds found that all bar 5 have performed worse than at least half of their peers during the recent 5-year period, and a total of 81% of their funds received a poor 1 or 2-star performance rating. However, Lloyds also offers investors access to their e-investment service, which is a selection of 3 managed funds, each to suit a different risk profile. Scottish Widows also manage these three funds, and they are available through Lloyds banking group subsidiaries Halifax and the Bank of Scotland. These funds are essentially portfolios as they invest in a range of other funds chosen by the fund manager. Each of the underlying funds is either Aberdeen Asset Management funds or Scottish Widows funds. However, our analysis found that the majority of these funds have underperformed. Indeed, questions can be raised as to why some of these funds are included at all? For example, the Aberdeen Global High Yield bond fund appears in all 3 managed fund portfolios. This fund returned cumulative growth of 17.92% over the recent 5-year period, which was well below the sector average of 26.09% and worse than 87% of funds in its sector. Another fund within all three managed growth funds is the Scottish Widows Corporate Bond, which currently holds some £3.5 billion of client funds under management. This fund has consistently been among the very worst funds in its sector for growth, and over the recent 12-months, it returned negative growth of -1.52%, which was the worst in its entire sector. View the full report in the August 2018 edition of the Yodelar investor Magazine. Register now for just £1 and access all premium features including top funds and model portfolio reports. In 2014 Lloyds banking group sold Scottish Widows Investment Partnership to Aberdeen Asset Management in a deal reported to be worth £660 million - Although this deal did not include Scottish Widows, the groups' life, pensions and investment business, which Lloyds said was “core” to the group. However, at this time an agreement was struck for Aberdeen to manage Scottish Widows funds in a deal reportedly worth £130 million per year to Aberdeen. This relationship between Lloyds and Aberdeen hit the rocks when in August 2017, Aberdeen Asset Management and Standard Life completed a £11 billion merger. Lloyds later announced that it intended to end its relationship with Aberdeen (now Standard Life Aberdeen) because it felt that their merger had made them a “material competitor”. While a number of investment houses including BlackRock and Schroders are understood to be in the running to take over management of those assets, Standard Life Aberdeen made it clear in May that it would not give up the mandate without a fight. The breakdown of Lloyds’ relationship with Aberdeen not only adds confusion for investors in Scottish Widows funds but also for those invested in Lloyds' 3 managed growth portfolios, which are also sold by Halifax and the Bank of Scotland. With such uncertainty, it is expected that a proportion of their investors will look to move to clearer waters. What About Barclays Investment Funds? Barclays is one of the most advanced banks when it comes to its investing services. Their platform provides investors with access to thousands of funds including their own range of unit trust funds and offshore funds, and recently Barclays expanded its Smart Investor service with the introduction of their range of ready-made portfolios. The new portfolios, simply called "Ready Made Investments", offer a range of "growth" and "income" funds tailored to investors who see themselves as having a low, moderate or high tolerance for risk. Each Ready-made Investment is a choice from a range of Barclays funds that invest in different areas and types of investment around the world. To assess how well Barclays investment offerings have performed we analysed the recent 1, 3 & 5-year performance of each of their funds, including their readymade portfolios. Our analysis of all 52 Barclays investment funds identified that a significant proportion have a history of underperformance, with 73% receiving a poor 1 or 2-star performance rating. Among the worst performers was the Barclays Dividend & Growth fund, which currently holds £260 million of client funds. Over the recent 12-months, this fund returned growth of 1.52%, which ranked 145th out of a total 152 funds in its sector. Over 5-years it didn’t fare much better with its growth of 29.94% falling below 94% of competing same sector funds. However, 6 of the 52 funds analysed consistently outperformed their peers and received a performance rating of 4 or 5-stars. 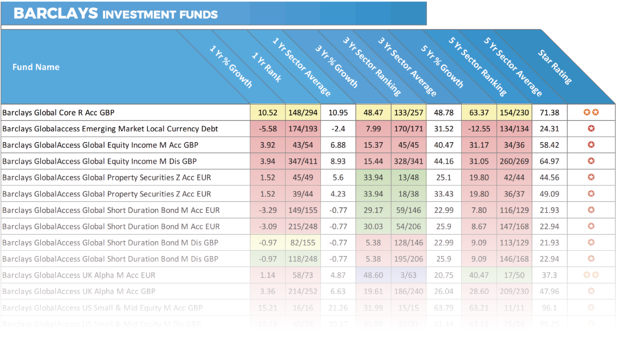 Currently, Barclays offers a range of 7 Multi-Asset funds that act as readymade portfolios. Two of which are income portfolios and five are growth-focused portfolios. Over the recent 1, 3 & 5-year periods both income portfolios have struggled for performance. In particular their moderate to low-risk Multi-Asset income fund. This fund has endured a torrid 12 months returning negative growth of -0.42%, which ranked 249th out of 278 funds in its sector. However, 3 of the 5 growth portfolios have shown promise with the high – moderate risk Barclays Wealth Global Markets 4 fund ranking among the best funds in its sector over the past 1 and 3-year periods. Despite some positive performance, there are similar funds within the same sectors that have consistently delivered higher returns. At the height of the financial crisis in 2008, the Treasury had to step in to bail the Royal Bank of Scotland (RBS) out for £45 billion. In the years since the bank failed to make a profit until 2018 when it was announced that they returned an annual profit of £752 million compared to a loss of £6.95 billion the previous year. However, there could be more woes on the way for RBS as they still face a potentially massive fine from the US Department of Justice over the sale of financial products linked to risky mortgages. With years of instability, RBS has fallen behind other banks when it comes to their investment offering. However, they do manage 11 unit trust funds which are currently only available to their customers. Each of these funds was analysed for performance alongside all other competing funds within the same sectors, and unfortunately for RBS, all 11 funds consistently underperformed and ranked among the very worst in their sectors for performance. How Competitive Are Santander’s Investment Funds? Santander UK is a wholly owned subsidiary of the major global bank Banco Santander. Since their launch in 1988, they have established a network of 806 branches and a workforce of around 20,000, and through their ambitious growth strategy, they aim to become the best retail and commercial bank in the UK. Through the Santander investor hub, they currently offer investors access to a range of 3 different investment options which include their selection of Multi-Asset funds, their general investment funds and a selection of funds from third-party fund managers that meet Santander ISA Managers' selection criteria. Currently, Santander has 38 funds under their management, however, as 18 of these funds are presently unclassified and do not belong to any investment sector we were unable to analyse them for comparative performance. However, 5 of these funds have returned negative growth over the recent 12-months. Our performance analysis of the remaining 20 Santander funds again identified underperformance from the vast majority, with only one fund receiving a good 4-star performance rating. Among the funds to underperform was the popular Santander UK Growth Unit Trust fund, which currently manages just under £1 billion of client money. In the 5-year period up to 1st August 2018, this fund returned cumulative growth of 33.37%, which fell well short of the 47.96% sector average and lower than 83% of its peers. Despite their pursuit of greater investment income, our analysis of 4 of the UK's largest and most popular banks identified widespread underperformance from the significant majority of their funds. The public opinion of banks has improved in recent times, but based on our analysis, their funds lack competitiveness when compared to their peers, and with some fund management firms offering consistently better performing, more efficient investment options, investors should look beyond banks when it comes to investing their money.